Although looking simple, the ice scraper is a handy tool to have around especially in the winter season. It helps you to quickly and easily remove ice, snow and frost that may have formed giving you a better view. Auto scrapers unlike the ordinary ones are much smaller, lighter and compact and can easily fit inside a bag or glove compartment. Some feature an extendable handle that improves portability and storage. The best type will have a firm blade that easily breaks down hard ice, clears the ice, snow and frost without leaving any marks, and has a soft and ergonomic handle. To assist you in purchasing the right equipment, we now present the 10 best ice scrapers for 2018. 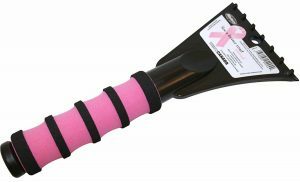 This pink scraper helps you remove snow and ice without using too much effort. It comes with a plastic blade that is effective and is less-likely to scratch glass, plastic and other surfaces. The long 10-inch handle is ergonomically-designed and can be held firmly without causing any numbness or fatigue on the fingers and hands. Some users nevertheless argue that the plastic blade is fairly weak compared to metal ones. The IceDozer 2.0 plus will easily scrape off any snow and ice from glass and other surfaces. It is build from heavy-duty plastic that can withstands occasional use as well as the elements .The handy tool features a scraping unit, a brush to help wipe off any remnants and a flexible plastic handle. Weighing approximately one pound, the scraper is not only light but also comfortable to use for extended periods. One drawback is that short people may find this scrapper a bit short to reach distant zones. This luxurious-looking scraper will get rid of snow, frost and ice within minutes giving you clear view. 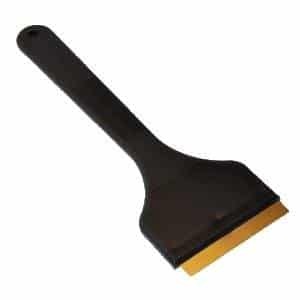 The heavy-duty brass scraper is sturdy enough to withstand thick and hard ice while the 9-inch handle provides good handling and comfort. The fairly-large blade surface will get rid of ice or snow faster than the narrower blades and also saves you from using too much effort or time. It’s however important to avoid using too much effort especially when the blade’s corner is touching the surface as it may leave some minute scratches. Save your time and energy when removing frost and get yourself this powerful ice scraper. The plastic edge is thin enough to smoothly cut through any amount of ice so doing away with frost should be quick and easy. It has a soft foam on the handle to ensure your grip is firm enough yet easy on your hand. A 4-inch wide chisel side means that no matter the size of the chunk of ice you got to deal with, you only need little effort to get the job done. Don’t be too disappointed that this device is 9.5 inches; this is to your advantage. All men will agree that lots of bending aren’t good for your back, at this length you won’t have to stoop. Scrapping ice off your path isn’t too hard after all, thanks to this handy ice scraper. Solid-built, good ergonomic, reliability are some of the reasons that give this ice scraper a slot in the 10 best ice/snow scrapers for 2018 review. 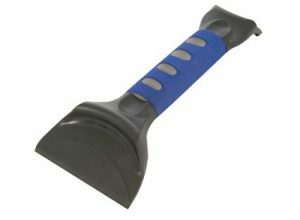 Made from tough ABS plastic, the scraper will remove snow and ice and won’t damage, scratch or chip the screen. It comes in a solid design consisting of a fairly-large handle that is well-padded to provide soft and comfortable to hold. The blade is much larger than most products in its category meaning it takes less time and less effort. And to assure you of long service, the well-built item comes in a pack of two. The only concern is the not-so-long handle. 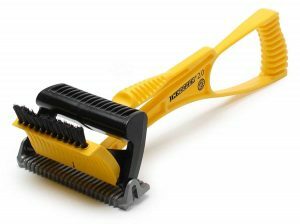 This light and compact scrapper easily removes snow, ice and frost without scratching the surfaces. It consists of a durable and flexible brass blade that can tackle tough ice and will maintain its effectiveness even after many uses. The easy grip handle not only allows you to work faster and effortlessly but is also soft on the fingers. Its small and light nature makes storage and carrying easy and convenient. A number of users however complain of the handle being somewhat light and flimsy. 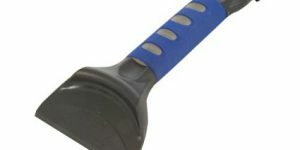 This tool is perfect for scraping snow and ice from the sidewalk, surface, lawn and other places. 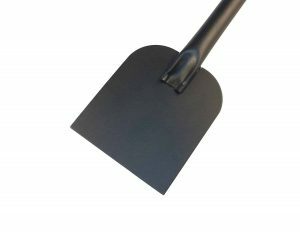 The commercial grade scraper is made from heavy-duty 11 gauge steel that will scrape off all the ice and snow without suffering damage. The long steel handle provides a firm grip and also allows you to remove the ice without having to bend too often or strain yourself. The 92200 steel scrapers are not the lightest and aren’t designed for use on car windshields/windscreens. 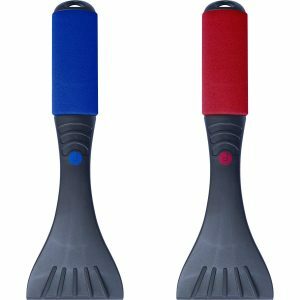 This Ice Scraper is molded from hard plastic and will remain firm and effective even when gorging out mounds of thick ice or snow. The double-sided ice chisel allows you to choose your preferred edge to tackle the ice or snow and also reduces the time spent clearing the buildup. It consists of reinforced buttresses that give it the strength of an ice axe but protect glass and other surfaces from scratches. The ice scraper nonetheless is not very long especially for short people. The Hopkins Subzero 16620 is among the most-innovative scrapers in the market and is suited for clearing snow, ice and frost. 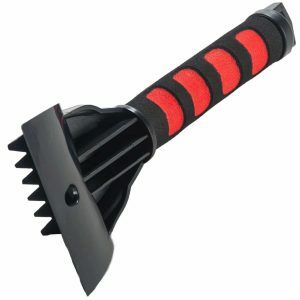 It is made from heavy-duty plastic and comes with a stiff 4.5-inch blade that easily removes any snow, ice or frost. 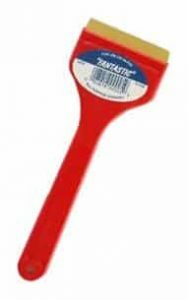 The oval-shaped scraper comes with an 11-inch long ergonomic handle that is solidly built and features contours and soft foam that offers good grip and comfort. However, the plastic is a bit hard and isn’t very effective as a frost squeegee. The Fantastic Ice& snow scraper is an everyday tool and is suited for a variety of applications. Measuring 8 x 3 x 0.1 inches and weighing 2 ounces, the F101 scraper comes with a sturdy brass blade that removes snow and ice without leaving any scratches. It easily fits in the palm and features a user-friendly handle that is smooth and comfortable. 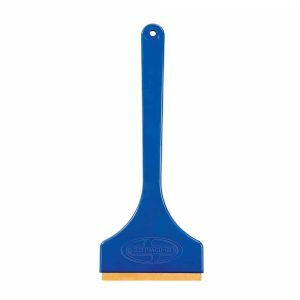 The scraper is small enough to fit inside the glove compartment or purse. Removing frost, snow or ice from the windshield/windscreen, hood, trunk or car’s top shouldn’t be a big problem. You need not risk scratching the surface by using the wrong blade or wasting lots of effort trying to crumble the solid ice. Also, you don’t have to purchase a separate squeegee to deal with fine snow or frost. All you deserve is any of the tools that feature in the above countdown. They are simple yet very effective, light but strong, and also ergonomic and user-friendly. Choosing the 10 best ice/snow scrapers not only keeps ice, snow and frost at bay but also gives you peace-of-mind.